Waverly Place in Cary, NC hosts many family oriented events throughout the year. On Saturday, November 8th, between 11am – 2pm, the Local Foodie Fest was held in front of the Whole Foods Market, who hosted the event. 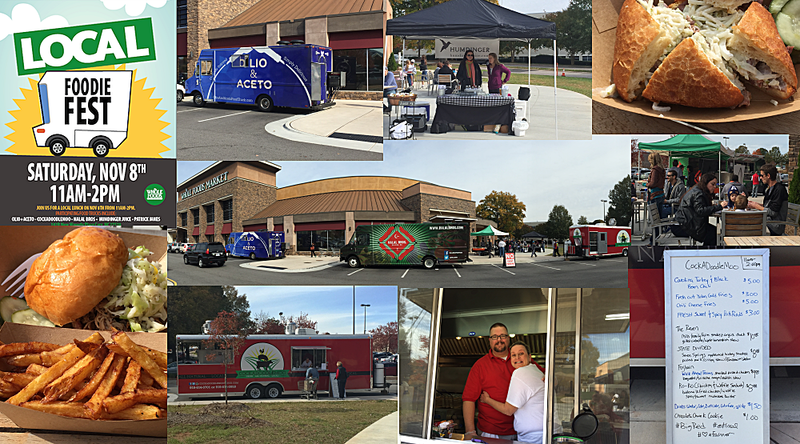 Billed as a local lunch, several food trucks, as well as one new addition to the growing food truck fleet in the Triangle, Cockadoodlemoo, and two favorites among food truck enthusiast, Olio and Aceto and Halal Brothers attended the event. Also on hand were Patrick Jane’s Pizza, located in the Shoppes of Kildare and Humdinger Juice. The friends took the opportunity to review the new addition to the food truck fleet, Cockadoodlemoo, and introduce ourselves to the proprietors, Doug and Jolie Rollins, as well as give a review of the fare. Cockadoodlemoo had been following us on twitter for several months before this, and we felt that we were already acquainted. The food offered by Cockadoodlemoo consisted of many North Carolina favorites, including; pulled-pork, pork rinds and beef brisket. The menu also included; chicken and waffles, French fries, chili cheese fries and turkey and black-bean chili. 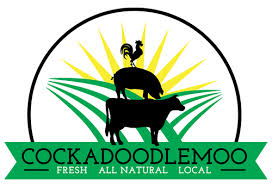 It was apparent immediately that Cockadoodlemoo was following a ‘farm-to-table’ approach to their cuisine, which is fast becoming popular among food truck venders, as well as patrons in the food truck culture. Their ‘Raven’ used beef brisket from Mills Family Farm, while the ‘State Divided’ pulled-pork sandwich offered pork from Seven Springs Farm. The ‘Foghorn’ and the ‘Ro-Ro’ offered chicken from Walk Ahead Farms. We each ordered an entrée from the menu and sampled it. 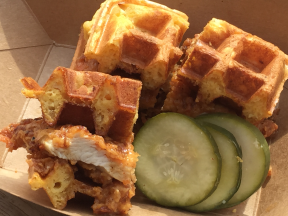 I had always been fascinated by the nation-wide phenomenon of chicken-and-waffles, but had yet to have the opportunity of trying it for myself, so I ordered the Ro-Ro. A delicately buttermilk fried chicken breast, served with a waffle, with spicy/sweet molasses butter. The Traveler ordered the State Divided, which featured Seven Springs Farms pork, apple wood/hickory smoked, served with a crispy slaw. It can be dressed with either a vinegar style BBQ sauce, or a tomato/molasses BBQ sauce, hence the name, ‘State Divided’, depending on which part of North Carolina you hail from. Belle ordered, The Raven, which is made from a smoked Angus chuck from Mills Family Farm, and served on a grilled ciabatta bun with apple-horseradish slaw on top. We also ordered the fresh, sweet-and-spicy pork rinds, French fries and a chocolate chunk cookie. Below are our critiques of each dish. 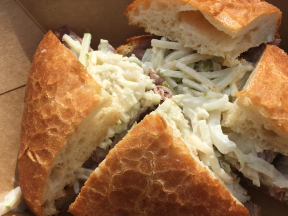 The Raven – Moist and delicious, made from Mills Family Farm smoked Angus chuck, toped with an apple-horseradish slaw, between as grilled ciabatta roll, served with quick-pickles. This sandwich is hearty and satisfying. We gave it high-marks across the board, including Jack and Bob. The State Divided – An extravagant sandwich, made with a hearty portion of Seven Springs apple wood/hickory smoked pork, with crispy slaw on top. Moist, tender and delicious, the friends all gave this entrée high-marks, and praise. Jack and Bob also enjoyed a few morsels of this, and found it pleasing to their pallet. The Ro-Ro – What could be better, a hearty chicken breast, with a spicy-sweet molasses glazing drizzled over, between two crispy, delicate waffles! Even the quick-pickles seemed to complement the entrée. Call me an official fan of the chicken-and-waffles craze. However, the same could not be said for my cohorts. They both gave this dish low marks, leaving me to wander if chicken-and-waffles is a ‘guy-thing’. It seems that more research will be needed to determine if this, in fact, is the case. Among the two cats, they too were divided, and only Jack found it delicious. 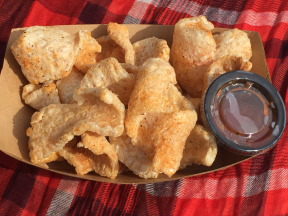 Sweet-and-spicy Pork Rinds – These were truly the biggest surprise. Light, delicate and flavorful, the pork rinds were not typical of others we had tried anywhere. We all gave this side high-marks. The cats were again divided in their review, and only Jack found the rinds to his liking.